Melt sugar with 1 Tbsp of water in a small sauce pan over medium heat until the syrup turns golden brown. Pour onto the parchment paper. Tilt the pan to spread the syrup to a thin layer and sprinkle a pinch of sea salt over it. Let the syrup set on the pan. It will harden as it cools. Break the brittle into shards. Wash and rinse strawberries, remove the stems using a paring knife. Puree the strawberries in a blender with the powdered sugar and lime juice until it turns into strawberry sauce. Place the cream, half and half, and sugar in a heavy sauce pan. Split the vanilla bean length wise and scrape the seeds into the pan. Toss the empty vanilla pods into the pan and bring the content to a simmer over medium heat. Remove from heat, remove the vanilla pods. Set aside to cool. In a bowl, beat the egg whites with a fork. Pour the egg white through a sieve into the cream mixture. Mix well with a whisk and divide the mixture into 5 lightly buttered ramekins. Place the ramekins in a baking pan and pour boiling water into the pan until the water level reaches ¾ of the molds. Bake in 300 degree F oven for about 90 minutes until the surface is golden brown. Turn off the oven and let the Panna Cotta cool completely inside the oven. When cooled, chill in the refrigerator for at least 4 hours or overnight. To serve, loosen the Panna Cotta by running a very thin knife heated in boiling water along the side of the ramekins. 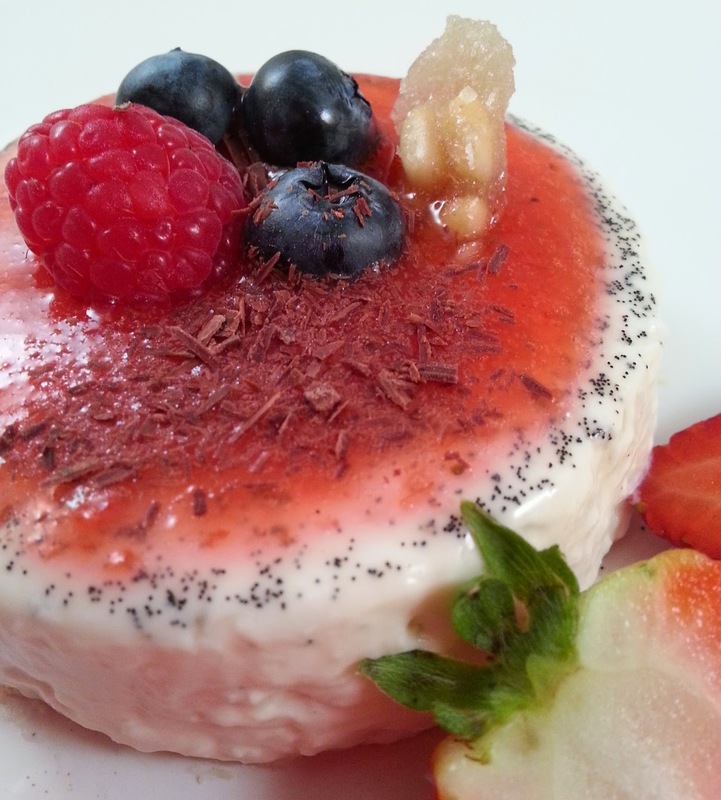 Spread a layer of strawberry sauce on top of the Panna Cotta. Garnish with strawberries, raspberries, blue berries, dust of chocolate shavings, and pine nut brittle. Thank you. I love the combination of look, smell, and taste of this recipe. Its definitely something I will prepare more often.